I am not built for running. I have remnants of childhood asthma. I have more muscle than the average bear which means I have to lug around more weight than most runners. Also, I do not believe that “runner’s high” is a thing, you’re all liars, because 99% of the time I am running I am thinking about the fact that it feels like I’m going to die. Sooooooo I went for a 6 km run outside with my boyfriend this weekend and did hill sprints and proceeded to realize all these things. Finishing it in a bear crawl because it was muddy and I was slipping… it was also crazy steep! We did hill sprints up a smaller (but still big) paved hill 2 times in the middle of the run (i.e. after running 3 kms) and then started running back and noticed a ridiculously steep, brambly “hill” (aka sheer cliff) that I thought would be a good idea. Which it was, until we started running back. I had to walk frequently but managed to keep up an ok pace. I am going to try to run outside (weather permitting) 3 times a week. Some times I wonder how I can love sprinting so much, love lifting so much and generally love all activities SO MUCH, and just not like running. But there is no way that is stopping me! Also this weekend I stopped off at my local organic/natural butcher…. Marlon’s at 2636 Yonge Street and grabbed a whole organic chicken to cook up with the fresh herbs and heirloom carrots I picked up on my Saturday morning trip to the St. Lawrence… oh yes, I do love Toronto and all the options we have here for food! Cooking a whole chicken is such a great way to get multiple meals in one shot, and if you guys have been reading for a while, you know I’m all about cooking multiple meals at a time. Obviously it’s not all only white meat like cooking just chicken breast is, but since I’m not in competition prep at the moment, that’s A-OK by me. Yummy crispy skin and the delicious dark meat bits from under the chicken are a serious weakness of mine. Wash and roughly chop the carrots, onions, and garlic and line the bottom of a shallow roasting pan and drizzle with some olive oil. No need to peel the veg at they are just being used as a trivet for the chicken. Cook for 1.5 hours, basting once in the middle or until the internal temp is 185F. I absolutely love whole roasted chicken, and when I know it’s organic and raised right that make it that much better… not to mention the taste is always so much more flavourful! I know that since it’s January 1 you are probably expecting some reflective post, but I figured there were enough of those and I would do something different. Just before Christmas I visited the St. Lawrence Market with my boyfriend and family. If you live in or around Toronto and have not gone to the St. Lawrence Market you are missing one of the absolute best things this city has to offer. Go early on a Saturday and you in for a treat. The main market is open as usual and across the street is a farmers market. Go to the carousel bakery and order a peameal bacon sandwich (not any other type, just get the bun with peameal bacon on it). If you can’t handle gluten, like me, just eat the bacon inside. I don’t know what they do but its the best peameal I have ever had and I was devastated that I could no longer have the bun. Go downstairs and get some coffee in whatever flavour you can imagine and watch them roast it . It’s a great process and the shop smells amazing because of it. Go to the farmers market and find the chocolate guy, pictured below. Have a chat with him about how awesome everything he makes is… then realize he is even more awesome because he has a whole section of stuff that is gluten-free. Try the brownies, you will not be disappointed. The farmer’s market is great and here is where health and new years-y stuff comes into play. I believe in fresh locally grown food. No, I don’t always find time to get local meat and produce but when I do I always wind up thinking I should do it more often. People are all excited about omega 3 eggs, where you feed the chickens flax-seed but no one thinks about the chicken meat. Why aren’t there omega 3 chickens? I know that a lot of people avoid the fatty parts of the chicken anyways, but what if the chicken had good fats like fish? Mr. Rowe explained that by feeding the chickens flax-seed, the fat became healthier and similar to what happens in grass-fed beef, the Omega 3 content is greatly improved. He has begun selling these types of chicken so if you are interested, check out one of his stores, or the St. Lawrence Market. Cows that are raised using the conventional farming methods require a lot less work, but a lot more input. According to Mr. Rowe it requires approximately 20 calories of input to creat 1 calorie of beef (remember that calories are a measure of energy) using today’s methods. Using the olde timey method it takes only 1/2 a calorie to produce 1 calorie of beef. I don’t know how he obtained these numbers and am merely quoting them, but I have heard similar things before, which makes me feel better about repeating it. What it does require is way more work on human’s part. He also pointed out that right now in the world there is a limited amount of food, and not enough jobs… so why don’t we create more jobs and limit to quantity of food required to make other food? when you take care of the animals, the animals take care of the earth. When you feed cows corn and things they can’t digest, they produce CO2 gas. But when cows have to graze on grass they actually improve the cycle and help to sequester the carbon instead of producing more… awesome. So there you have it, more reasons to eat grass-fed or naturally raised meats! Also, look at these beautiful veggies! 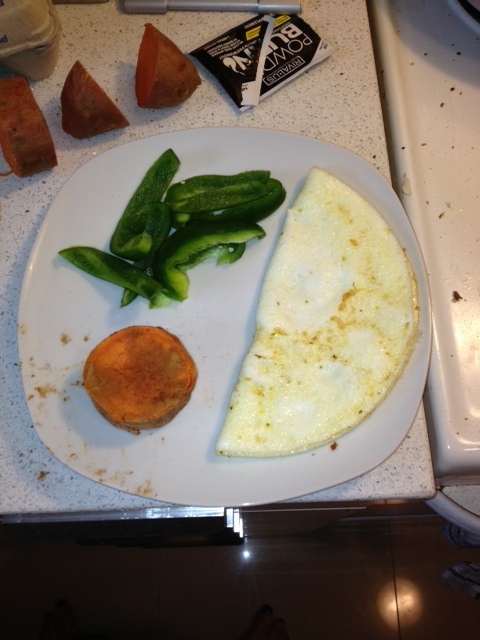 Not diet food – but delicious! Birthday dinners don’t have to be healthy right? 1 Prepare the sauce. Finely chop the onion. Heat olive oil in a saucepan on medium-high heat. Add the onions and sauté for 2-3 minutes. Add the minced garlic. Cook until fragrant, about a minute more. Add the tomatoes and oregano. Bring to a simmer, reduce the heat to maintain the simmer. Cook, uncovered while you prepare the chicken (about 10-12 minutes). 2 Preheat oven to 400°F. With a meat pounder (or heavy bottomed skillet which I have done in the past), pound the chicken pieces to flatten them to an even thickness – between 1/4 – 1/2 inch. 3 In a shallow bowl (large enough to dredge the cutlets), mix together the breadcrumbs, 1/2 cup of the Parmesan, and oregano. In separate shallow bowl, whisk together the eggs. 4 Heat 1/4 cup of olive oil in a large sauté pan on medium-high heat. The oil should be shimmering, not smoking. Dredge the chicken pieces 1 piece at a time first in the egg mixture, then in the breadcrumbs. Then lay the pieces in the hot sauté pan. Turn the heat to medium, then gently fry the cutlets until they are golden brown, about 3-4 minutes per side. 5 Spread enough tomato sauce to coat the bottom of a casserole pan or baking dish (that will fit however many chicken breast you have easily). Once the cutlets are browned on both sides, arrange them on top of the tomato sauce in the baking dish. spoon some more sauce over each of the cutlets. Sprinkle the tops with sliced basil. Then top the cutlets with slices of mozzarella and the remaining 1/2 cup of Parmesan cheese. 6 Bake in the oven for 10-12 minutes, or until the mozzarella begins to brown. Serve with pasta using the remaining sauce for the pasta (or not if you are like me and can’t eat pasta because gluten is evil) and caesar salad. I like renees caesar dressing and made about 5 slices of bacon cooked extra crispy to mix in with the salad and croutons. Andre finished his meal pretty quickly and even had a little bit more of my chicken since they were huge servings. For reference, he NEVER stuffs himself. He is one of those lucky people who just eats until he’s comfortably full and then stops (god I wish I could do that so easily!). But both this year and last he finished off the huge portion I gave him AND still had dessert. Look at that smile… and clear plate! In a separate large bowl, combine flour, oats, brown sugar, cinnamon, and nutmeg. Cut in butter until crumbly – if you don’t know how to do this here is a tutorial. It can be done with a pastry cutter which makes life easy, except i couldn’t find mine today so I just used a knife and occasionally my fingers to break up stubborn clumps. Press half of mixture in the bottom of a 9×9 inch pan and cover with berries, then sprinkle remaining crumble mixture over the berries. Bake for 30 to 40 minutes, or until fruit is bubbly and topping is golden brown (I once forgot about this for an hour and a half, so 50 additional minutes in the oven and it still tasted fantastic, it’s seriously indestructible as long as you use fresh fruit). I love serving this with a good quality vanilla bean ice cream, but some heavy cream or some greek yogurt would be great too. I kid you not, I actually laughed at the portion. It was ridiculous. I asked the waitress if I could maybe have more food and she had the manager come over and he pretended like it wasn’t a laughable portion of food (especially at the price of $26) but did agree to bring me out more vegetables, which ended up being exactly what I described above, with 2 additional green beans. So in total I got about double that amount of vegetables and a very small serving of pickerel. Delicious, but I was definitely not full. Oh well, better than going over board I guess. The point of the night however was not the food, but instead to celebrate with my grandma and she had a great night, so that is what is important! But always keep in mind that it is so important to have balance. A lot of people would not have gone to a restaurant this close to the competition where you don’t have control over the food you are eating, but you have to decide what is more important. I don’t know how many more birthdays my grandma has left so I think that is more important that sticking to my diet 100%. That’s it. I will be having 40 g of carbs starting today (from sweet potato, the veggies don’t count) and I am not to add any fat to anything during the week. I am supposed to have all my carbs before I workout, spread over 2 meals and then no carbs after that. I dislike this, but it’s for 6 days. I can hate my diet for 6 days. If you have read my blog up until now you know that I do not follow the typical bodybuilder’s diet of broccoli, chicken and brown rice. I like variety and I like enjoying my food so I am not happy with this plan, but I will do it because I want to look the best I can on stage. The trainer (Norvic) didn’t have all bad news though! I was anticipating just carbing up the day of the competition with a combo of good simple and complex sugars and getting in some good fats from nut butters, egg yolks and oils. Apparently I missed the memo on one of bodybuilding secrets. I am supposed to have a glass of red wine accompanied with chocolate (not dark chocolate, the normal kind) 30 minutes before stepping on stage while I pump up for the show! Why didn’t I know about this?! This is the best plan ever! I already went and bought a nice bottle of Folonari Ripasso (one of my favourites) and I will be buying some mini eggs for the chocolate portion because the are my absolute favourite. If you are wondering why this would be done I will tell you! \Wine (or any alcohol) increases blood flow to your muscles which helps to deliver the sugar to the muscles. Additionally, alcohol sugars do not need to be digested, they are absorbed into the blood directly through the lining of your digestive tract and can go straight to you muscles as well. The chocolate needs to be cheap so it has enough sugar and fat content. Fat helps make you more vascular and the sugars make you muscles look bigger. So it’s not just random, there is some science behind it. Plus the alcohol will hopefully help calm my nerves. So that is how I will be getting through this week. Another plus side and some motivation is the fact that my abs are looking pretty awesome. Look! I have way too much broth! The Back Compliments workout *I am calling it this because about every other time I do any pull ups or rear delt flyes I get a comment on my back that varies from “how do I get a back like that?” to “Wow, you’re strong!” not followed by “for a girl” and this workout has both! I am feelings much better today, so this workout didn’t leave me dying and I enjoyed a nice long stretch afterwards. Roughly chop without peeling or doing anything, all the veggies including the garlic (just smash each clove) and distribute in the bottom of a small roasting pan. Add some olive oil and spices except paprika to the veggies and mix to coat, then make sure that the bottom of the pan is covered with the veggies (this is called a trivet). Drizzle olive oil on the chicken (this helps the skin get nice and crispy) then generously spice the outside AND inside of the chicken. Place on top of the vegetable trivet and place in the oven. Cook for about 1.5 hours (or 20 minutes PLUS 20 minutes per pound that your bird is… i.e. 20 mins +(4*20) = 1 hour and 40 minutes) or until the internal temperature is 165 F.
At least twice during cooking, baste the bird in the juices from the pan to keep it moist and crisp up the skin even more. When finished, set the bird aside for 15 minutes to rest before carving. I love this method because it is so simple and I also eat some of the veggies from the bottom of the tray that are soaking in the juices… yum! Now you can either make an awesome gravy my mashing up the veggies in the pan and then adding some water and flour to the pan, simmering and thickening, then strain and serve… OR you can make broth, which is what I did. In the pot, looks like a reasonable amount. 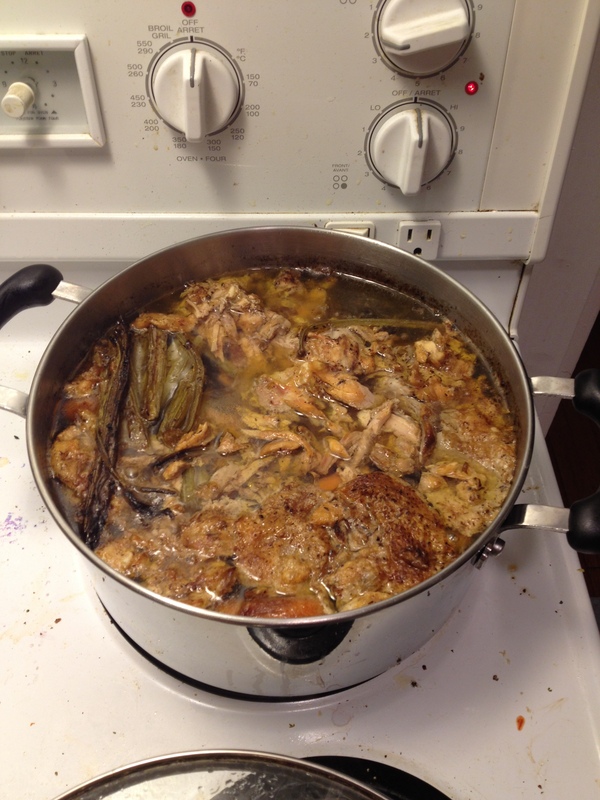 After you have picked the chicken clean, take all the unused bits like skin, cartilage and bones and put them in a large pot with a lid, you can also through the veggies from the pan and any juices in the pot. Then fill the pot with cold water high enough to cover the bones. Bring the pot to a boil over high heat, reduce heat to low and simmer for anywhere from 3 – 24 hours. Seriously, way too much broth!!! I let mine simmer overnight for about 10 hours and ended up with about 3 litres of stock. 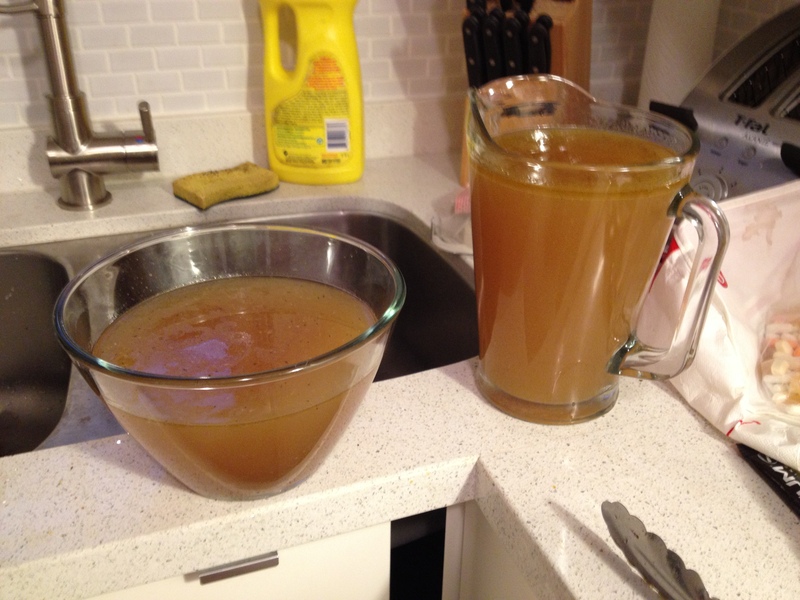 I have no idea what I will use this much stock for, but it is a nutritional powerhouse, so I will find uses for it. It is SUPPOSED to reduce, but I guess my simmer was too low because it didn’t reduce very much at all! One idea that I will use tonight is simple egg drop soup. it contains macro-minerals like calcium, magnesium, phosphorous etc in a form that our body can actually absorb and is easy to digest. So make your own broth!